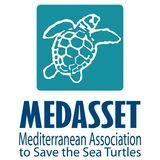 REPORT BY THE NGO Document prepared by MEDASSET - The Mediterranean Association to Save the Sea Turtles ____________________________________________________________________ This document will not be distributed at the meeting. Please bring this copy. Ce document ne sera plus distribué en réunion. Prière de vous munir de cet exemplaire. Measures 3-5, 7-8 and 12 that should be implemented on an ongoing basis. Measures 1-2, 6, 9, 10-11, 13-14 that have only partially been implemented to date. An overview of the progress reported by the Turkish authorities is annexed to this note. MEDASSET particularly reiterates its concern about lack of implementation of: a. b. Measures 6 and 1 for erosion control and greenhouse removal from the beach. Measure 10: The 1.5 million tons of highly toxic solid waste located right next to Kazanli’s green turtle nesting beach, is a severe hazard for the habitat, the sea turtle nesting population, human health and the entire Mediterranean. At the 30th Standing Committee Meeting in 2010, though Kazanli was not on the Meeting’s Agenda and following MEDASSET’s intervention during the Meeting, the Turkish delegate briefly informed that the toxic waste neutralisation process had started, that 200,000 tons of chromium had been neutralised and that the by-product was kept within the Factory’s grounds, until a landfill site was established. At the 2013 Standing Committee Meeting the Turkish delegate made a one-page statement reporting the same information as in 2010, therefore, there does not seem to be any progress in removing the toxic waste from the nesting beach. We urge the Turkish delegation to provide a full update on progress made on implementing Recommendation No. 95 (2002), and the Standing Committee to consider if the reported progress is considered satisfactory. Should there be no reporting at the 2014 Meeting, we urge the Standing Committee to consider applying Rule 11 of the adopted Rules of Procedure of the Standing Committee, and organise an on-the-spot assessment to obtain information on the implementation of Recommendation No. 95 (2002) and especially of Measure No. 10. ANNEX BACKGROUND SUMMARY ON THE CONSERVATION OF MARINE TURTLES IN KAZANLI BEACH Green turtles, Chelonia mydas, are regarded as globally endangered.1 In the Mediterranean, researchers estimate that there are only 339-360 green adult female turtles nesting in the region, laying about 1,500 nests per year,2 and until recently were listed as a critically endangered regional subpopulation (the subpopulation was later de-listed due to changes in the IUCN Red List criteria). The beach of Kazanli in southern Turkey forms one of the most important green turtle nesting areas in the Mediterranean. In 1988, it boasted the highest density of green turtle nesting in the Mediterranean.3 More recently, it was listed as the second most important green turtle nesting beach in the Mediterranean (nests/year ranged from 43 to 403 in 1988-2006).4 Part of Kazanli nesting beach is nationally designated as a 1st Degree Natural ‘SIT’ Protected Area. The total length of the beach is 4.5 km (see map at the end of this annex). Surveys in the 1980’s identified a number of serious threats, which increased in subsequent years and although confirmed and reported by numerous researchers and conservationists, the responsible authorities failed to take action for several years. As a result, the nesting beach is subject to serious deterioration. MEDASSET has been monitoring Kazanli nesting beach and reporting on conservation problems since 1999. Main threats identified are: erosion, wastewater and toxic waste pollution, litter, sand extraction, light pollution, agriculture (greenhouses) on the rim of the nesting beach, coastal fishing during the nesting season, disturbance to the species during nesting and lack of public awareness. To the rear of the beach, is a Soda Chrome Factory that has deposited 1.5 million tons of hazardous toxic waste, covered with plastic sheeting, directly next to the Kazanli nesting beach. The waste has a high concentration of toxic chromium (Cr 3+/6+) compounds, and is a by-product of the factory’s activities in the 1990s. The removal of this hazardous waste from the beach is of high priority for environmental and human health. In 2000 and 2001, MEDASSET alerted about the release of toxic waste into the sea off the nesting beach from the beachside factory. Seawater samples, which MEDASSET analysed, were found to contain chromium concentration 13,500 times higher than natural levels. More than 23 green turtles were found dead. Discharges into the sea resulted in turtles emerging to nest with their body encrusted with white CaCO3. remove as a matter of urgency the row of greenhouses closest to the sea in beach section K3; remove, as soon as feasible, other greenhouses in beach section K3 through the appropriate legal and administrative procedures and restore that space to favour turtle nesting; move the taxi parking area away from the beach as a matter of urgency; periodically remove the plastic debris from the beach; screen the lights of the municipality of Kazanli and the Soda-Chrome factory so as to avoid photopollution on the beach; maintain monitoring of the chemical waste discharge into the sea by the chrome factory; establish a reliable and permanent monitoring of nesting activities in the beach and make an independent assessment of potential burden of the natural environment of Kazanli, with substances released by the soda-chrome factory; assess the potential risk of effluents of the soda-chromium factory to wildlife; set in place a monitoring of beach erosion, so as to take remedial measures as needed; promote public awareness on the presence and interest of marine turtle nesting in Kazanli, addressed in particular to local population; fully implement the existing environment plan and assure the necessary financial and human resources to this end; remove illegal building in beach section K1; remove as appropriate the hazardous waste accumulated over the years close to the beach as a result of industrial activities; consider the removal of the wedding hall of Kazanli from the beach, to be relocated elsewhere; apply appropriate treatment to sewage waters from Kazanli, so as to free the back of the beach from pollution; look for an appropriate solution to remove houses on the beach that were constructed legally; reduce the impact of agrochemical products in the area around Kazanli. As some of the measures were implemented by the Turkish authorities, and considering that a better overall protection of the area had been achieved, despite MEDASSET’s call to maintain the case file open, the Standing Committee at its 24th Meeting in 2004 provisionally closed the file, requesting that the Turkish Government continues to report on progress. However, the Turkish Government did not report on the conservation status of Kazanli in 2005, and no delegation attended the 2005 Standing Committee Meeting. In 2006, the Turkish Government submitted a brief report, but again did not send a delegate to the Standing Committee meeting. In 2007, the issue was discussed at the Standing Committee, which decided not to re-open a file, but to request that the Turkish Authorities submit a report in 2008. At the 2008 Standing Committee Meeting, the Turkish Government reported on progress to implement measures listed under Recommendation No. 95 and further informed that the Soda Chrome Factory’s plan to set up a landfill site had been delayed, and that the solid waste treatment would commence in July 2009, while the operation of the landfill was set to begin in November 2009. MEDASSET called on the Government of Turkey, to start implementing without delay plans to put the hazardous waste in a safe location, far from the green turtle nesting beach and the sea. According to the March 2009 Bureau Meeting Report, the Turkish authorities reaffirmed their intention to remove the hazardous waste from Kazanli Beach, but notified that “it would take some time”. They confirmed that the construction of the waste neutralisation facility was underway and was expected to be completed as planned. EIA studies were being carried out for the waste storage site. According to the report submitted by the Government to the 2009 Standing Committee Meeting, the waste disposal facility was to be finished by October 2009. At the 2009 Meeting, the delegate of Turkey reported on progress on the implementation of Recommendation No. 95, and informed that the removal of the toxic waste was to start soon, an investment had been made to establish a neutralisation plant, and that waste removal will take eight or ten years. MEDASSET welcomed progress made, and highlighted that together with the toxic waste management several points remain unsolved, such as the severe coastal erosion which requires more drastic measures on behalf of the authorities. 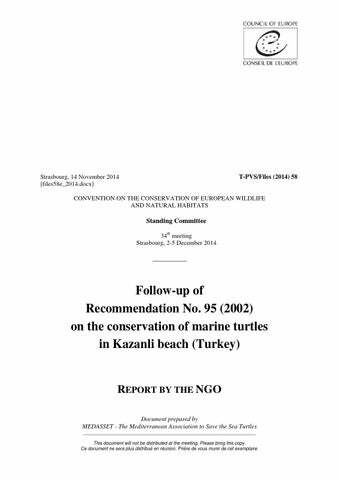 STATEMENT BY TURKISH DELEGATE AT THE DECEMBER 2013 STANDING COMMITTEE MEETING Republic of Turkey, Ministry of Forestry and Water Affairs Government Report on Follow-up of the Recommendation No.95 (2002) on the conservation of marine turtles in Kazanlı beach. Within the scope of article 7 of the recommendation no. 95, an awareness raising program was developed with the contribution of biology department of the local university. Again by the help of university’s marine turtle research unit, visitors and local people are informed about species and habitat protection, breeding behaviors of marine turtles and so on. Around 500 people attended those meetings. Regular meetings within the scope of an education program for local fishermen were held separately. Related with this issue and with the article -3 of the recommendation, plastic, glass and other debris on the beach is periodically removed. This program has been in use for two years with the participation of volunteers living around. Kazanlı municipality’s and other back light sources were concealed to provide newly hatched turtles better chances of reaching the sea. To support hatchlings further, the entrance of motorized vehicles to the beach during the breeding time was banned and the beach surface was smoothed so as to wipe out tire tracks. Chemical wastes of the chrome factory were analyzed by an accredited laboratory and the results are promising. Chromium levels and other chemical compounds are well below standard values. Unfortunately, there is no progress in the removal of illegal building in section K1 and greenhouses are still remaining next to the beach. The last but definitely not the least important issue is the eradication of toxic solid waste. The company has built a facility to dispose of this waste and it has been actively working since November 2009. The wastes are neutralized, pressed, and then deposited in a temporary landfill in factory’s ground. The EIA of the permanent landfill is still going on. Once finished, all the waste will be deposited there. The company is willing to dispose of the chemical waste, but it is a slow process and only 200.000 tons of the total 1.5 million-ton waste is neutralized until today. This is the current situation in Kazanlı, although slow, there is progress. EXCERPT OF MEDASSET ANNOUNCEMENT ON 14 DECEMBER 2010 Announcement, 14 December 2010: Bern Convention, Council of Europe, 6-9 December, 2010: Sea turtle conservation problems in Cyprus and Turkey For the 22nd ongoing year MEDASSET attended the Meeting of the Contracting Parties to the Convention on the Conservation of European Wildlife and Natural Habitats (Bern Convention), at the Council of Europe, in Strasbourg, France. The following is a short report of sea turtle conservation problems in Cyprus and Turkey, as discussed at the 30th Standing Committee Meeting of the Convention. [...] Kazanli (Turkey): The case of the run‐off of highly toxic waste into the Mediterranean Sea by a Soda Chrome Factory was first brought to the Bern Convention by MEDASSET in 2001. A Case File was opened by the Bern Convention Standing Committee in 2002, and then provisionally closed in 2004. The issue of Kazanli has remained on the Convention’s Meeting Agenda since. Referring to the 1.5 million tons of highly toxic solid waste sitting on this most important green turtle nesting beach, the Delegate of Turkey informed the Convention Meeting that the neutralisation plant to convert the toxic waste was established within the Factory’s grounds and that the process has started. Two hundred thousand tons of chromium have already been neutralised and are kept within the Factory’s grounds. They will remain there until they are transferred to a landfill site, which so far has not been defined. The Delegate also informed that nest monitoring on the beach continued in 2010. A total of 474 green and 15 loggerhead nests were recorded. MEDASSET called upon the Turkish Government to continue reporting regularly to the Convention on all issues concerning Kazanli. REFERENCES Baran, I. & M. Kasparek. 1989. Marine turtles Turkey. Status survey 1988 and recommendations for conservation and management. WWF. Heidelberg. ISBN 3-925064-07-9 Broderick, A.C., F. Glen, B.J. Godley BJ, G.C. Hays. 2002. Estimating the number of green and loggerhead turtles nesting annually in the Mediterranean. Oryx 36:227-235. Casale P. & D. Margaritoulis (Eds.) 2010. Sea Turtles in the Mediterranean: Distribution, Threats and Conservation Priorities. IUCN/SSC Marine Turtle Specialist Group. Gland, Switzerland: IUCN, 294 pp. Kasparek, M., B. J. Godley & A. C. Broderick. 2001. Nesting of the Green Turtle, Chelonia mydas, in the Mediterranean: a review of status and conservation needs. Zoology in the Middle East 24: 4574. Yerli, S. and F. Demirayak. 1996. Marine turtles in Turkey: a survey on nesting site status. DHKD. CMS Report No. 96/4 133pp. On the conservation status of some nesting beaches for marine turtles in Turkey; On the conservation of marine turtles in Kazanli beach (Turkey).